The cost of a distillation unit includes the capital cost of the column, determined largely by the number and diameter of the plates, and the operating costs, determined by the steam and cooling water requirements. The depreciation charges may be taken as a percentage of the capital cost, and the two together taken as the overall charges. The steam required will be proportional to Vm, which may be taken as Vn where the feed is liquid at its boiling point. 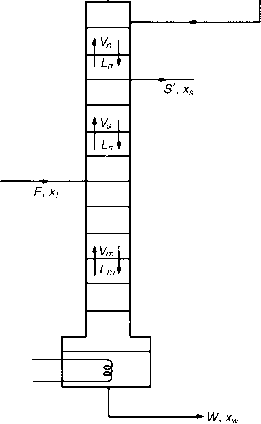 From a material balance over the top portion of the column, Vn = D(R + 1), and hence the steam required per mole of product is proportional to (R + 1). This will be a minimum when R equals Rm, and will steadily rise as R is increased. The relationship between the number of plates n and the reflux ratio R, as derived by Gilliland(30), is discussed in Section 11.7.7. The reduction in the required number of plates as R is increased beyond Rm will tend to reduce the cost of the column. For a column separating a benzene-toluene mixture, for example, where xy = 0.79, xd = 0.99 and xw = 0.01, the numbers of theoretical plates as given by the McCabe-Thiele method for various values of R are given as follows. The minimum reflux ratio for this case is 0.81. (a) The operating costs rise and are approximately proportional to (R + 1). (b) The capital cost initially falls since the number of plates falls off rapidly at this stage. (c) The capital cost rises at high values of R, since there is then only a very small reduction in the number of plates, although the diameter, and hence the area, continually increases because the vapour load becomes greater. The associated condenser and reboiler will also be larger and hence more expensive. The total charges may be obtained by adding the fixed and operating charges as shown in Figure 11.19, where curve A shows the steam costs and B the fixed costs. The final total is shown by curve C which has a minimum value corresponding to the economic reflux ratio. There is no simple relation between Rm and the optimum value, although practical values are generally 1.1-1.5 times the minimum, with much higher values being employed, particularly in the case of vacuum distillation. It may be noted that, for a fixed degree of enrichment from the feed to the top product, the number of trays required increases rapidly as the difficulty of separation increases, that is as the relative volatility approaches unity. A demand for a higher purity of product necessitates a very considerable increase in the number of trays, particularly when a is near unity. In these circumstances only a limited improvement in product purity may be obtained by increasing the reflux ratio. The designer must be careful to consider the increase in cost of plant resulting from specification of a higher degree of purity of production and at the same time assess the highest degree of purity that may be obtained with the proposed plant. 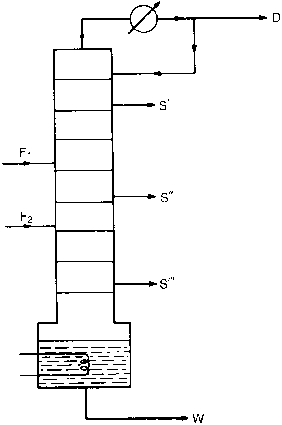 In general, the greater the reflux ratio, the lower is the number of plates or transfer units required although the requirements of steam in the reboiler and cooling water in the condenser are both increased and a column of larger diameter is required in order to achieve acceptable vapour velocities. An optimum value of the reflux ratio may be obtained by using the following argument which is based on the work of Colburn(31) . Because there is no simple equation relating n and dn/dR, it is not possible to obtain an expression for Ropt although a method of solution is given in the Example 11.18 which is based on the work of Harker(32) . In practice, values of 110-150 per cent of the minimum reflux ratio are used although higher values are sometimes employed particularly in vacuum distillation. Where a high purity product is required, only limited improvements can be obtained by increasing the reflux ratio and since there is a very large increase in the number of trays required, an arrangement by which the minimum acceptable purity is achieved in the product is usually adopted. From Figure 11.20 it may be seen that, when stepping off plates down the top operating line AB, the bottom operating line CE cannot be used until the value of xn on any plate is less than xe. Again it is essential to pass to the lower line CE by the time xn = xb. The best conditions are those where the minimum number of plates is used. 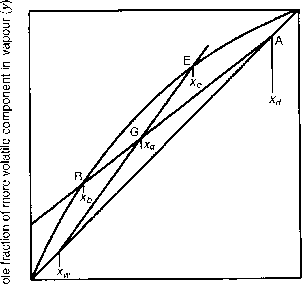 From the geometry of the figure, the largest steps in the enriching section occur down to the point of intersection of the operating lines at x = xq. 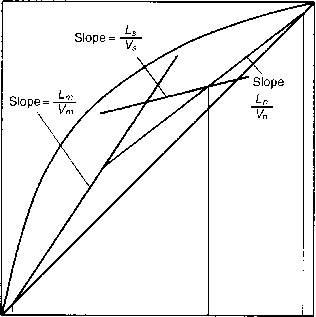 Below this value of x, the steps are larger on the lower operating line. Thus, although the column will operate for a feed composition between xe and xb, the minimum number of plates will be required if x/ = xq. For a binary mixture at its boiling point, this is equivalent to making x/ equal to the composition of the liquid on the feed plate. F1 and F2 are separate feed streams to the column. Sidestreams are most often removed with multicomponent systems, although they may be used with binary mixtures. A binary system is now considered, with one sidestream, as shown in Figure 11.22. S' represents the rate of removal of the sidestream and xs' its composition. Since the sidestream is normally removed as a liquid, Ls — (Ln — S') and Vs — Vn. How does reflux ratio affect number of trays? 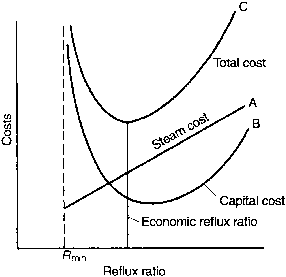 How does the reflux ratio affect capital and operating costs of distillation? How does reflux ratio affect operating and capital cost? How does the reflux ratio affect the capital and operating costs of a distillation unit? What is a acceptable reflux ratio? How top operating line pass through the point xd xd? How to determine optimum reflux ratio distillation? 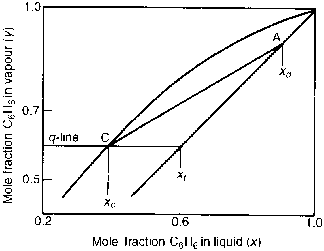 How reflux ratio affects operating cost? What is minimum reflux ratio and optimum reflux ratio? How to find flow rate ofreboiler using reflux ratio?